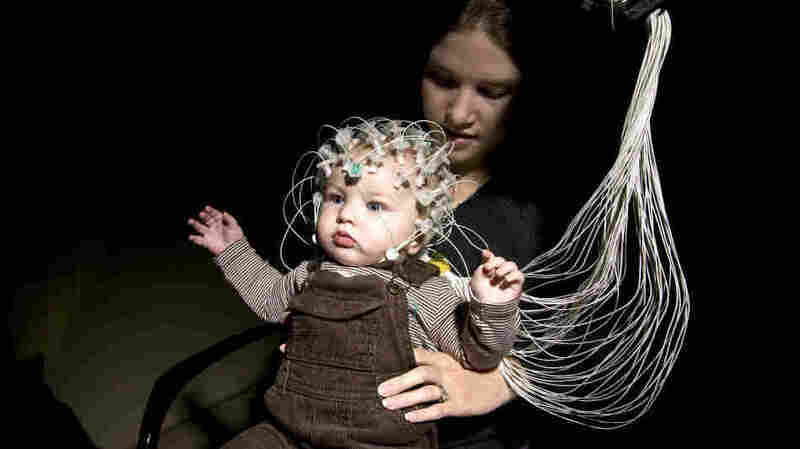 Looking For Early Signs Of Autism In Brain Waves Scientists hope to diagnose autistic children while they are still infants by probing unusual electrical signals in their brains using electroencephalography. EEG is also providing hints about precisely how autism affects the brain and which therapies are likely to help children with autism spectrum disorders. A technology that monitors electrical activity in the brain could help identify infants who will go on to develop autism, scientists say. The technology, known as electroencephalography, or EEG, is also providing hints about precisely how autism affects the brain and which therapies are likely to help children with autism spectrum disorders. "Right now, the earliest we can reliably identify a child is, say, 3 years of age," says Charles Nelson, a professor of pediatrics and neuroscience at Children's Hospital Boston and Harvard Medical School. "Our work is designed to see [if we] can we do that in early infancy, long before any signs or symptoms of autism are apparent in the child's behavior." If EEG lives up to its early promise, Nelson says, children with autism might start getting therapy before their first birthday. EEG works by recording electrical signals that come from brain activity. Children who get tested wear something that looks a bit like a hair net. The device holds several dozen electrodes against their scalp. "Once that's on, the child can either sit on a parent's lap or sit in a chair by themselves if they're old enough," while a computer analyzes the signals coming from their brain, Nelson says. Nelson is part of a team that has been looking for patterns in those signals that indicate autism. Another member of that team is William Bosl, a research scientist at Children's Hospital Boston and an instructor at Harvard Medical School. "What we're looking for are markers or features in the signals that tell us something about the brain as it develops," Bosl says. And they've found at least one promising marker, he says. It involves very high frequency brain waves known as gamma oscillations. Bosl and Nelson have been studying those oscillations in 79 children from the time they were 6 months old. Some of the children are at high risk for developing autism because they have an older sibling with the disorder. The rest have no special risk factors. "What we've observed is that starting as young as 6 months, maybe even younger, infants who have a high risk for developing autism show dramatic reductions in gamma activity," Nelson says. That suggests EEG could help identify very young children who will go on to develop autism, he says. But Nelson and Bosl say they won't know for sure until the children in their study reach the age when the disorder becomes obvious. In the meantime, other research using EEG is revealing how autism affects the brain and how intervening early might make a difference. Sophie Molholm of Albert Einstein College of Medicine in New York is part of a team that's been studying how autism impairs the brain's ability to integrate information from the senses. Molholm says most people do this with ease. "We walk through the world and our sensory systems are continuously presented with stimulation: Visual stimulation. Auditory stimulation. Touch. Smells. And we very automatically put this information together to make sense of the world and to navigate it," she says. For example, when a person is listening to someone at a noisy cocktail party, he'll focus on that person's face. And his brain will automatically combine what he sees with what he hears, allowing him to understand more words than he would otherwise. But people with autism often have trouble doing this, she says. That became clear in an experiment that tested the ability of children with autism and typical kids to combine visual and auditory information, Molholm says. Molholm and her colleagues had the children listen to words that were hard to understand because they were masked by white noise. Sometimes the words were accompanied by a video of a person speaking. Other times they just had to listen. Molholm wanted to know whether the brains of children with autism would react differently than did other kids' brains. And they did. "What we find is that children with autism don't benefit nearly as much from the visual signal as typically developing children," she says. Other EEG research by Molholm's team indicates that that's because their brains are having trouble integrating what they're seeing with what they're hearing. The process was still happening, she says, but it took longer and it was less complete. Molholm says one surprising thing her research suggests is that the brains of kids with autism seem to get much better at integrating sensory information when they become teenagers. "The beauty of that finding is that it suggests that the neural circuitry is intact," she says. "It's just not coming on line during the earlier childhood years." Molholm says it's not clear why things change in teenagers with autism. But she says it's possible that their neural circuitry might come on line sooner if they are diagnosed early and begin therapy that encourages them to practice integrating information from different senses.